Film is at its best when the subject in hand is presented through the obvious visual elements of the medium rather than outside factors such as sound, dialogue etc. The lure of silent cinema is an exotic one, one perhaps of curiosity as well as nostalgia for a time when cinema’s aims seemed in line with that of the artistic being parallel to the entertaining. 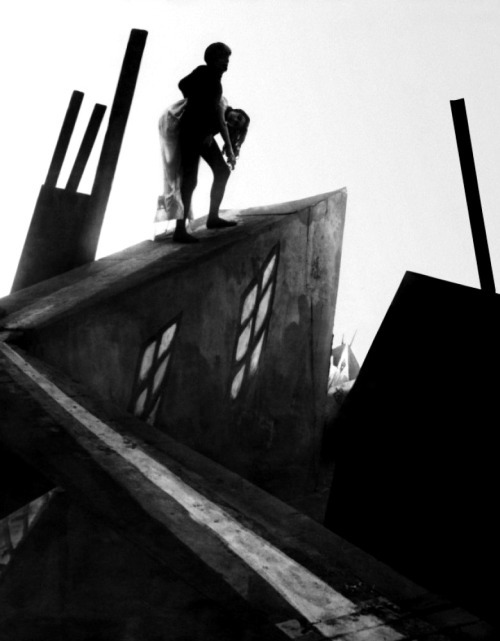 Describing 1920’s The Cabinet of Dr. Caligari as a straighforward horror film would be too generalising but within its dreamy visuals and narrative, all the elements of horror film’s future are embedded albeit subtly. Cinema’s realisation that the moving image could be an exciting way to induce a safe form of fear had been around for over twenty years before Caligari perfected it. Even with some the first films ever made, the Lumière brother’s train calling into a station for example, the fear of the moving image was a natural and gripping aspect of the medium still in infancy. Though by no means the first horror film, Caligari does have the honour of the being the first film to fit comfortably within the genre. If made in 1970s Italy, it could easily pass as a Giallo or some other Fulci/Argento horror mystery. Robert Weine’s film however is firmly transplanted into the roaring twenties. 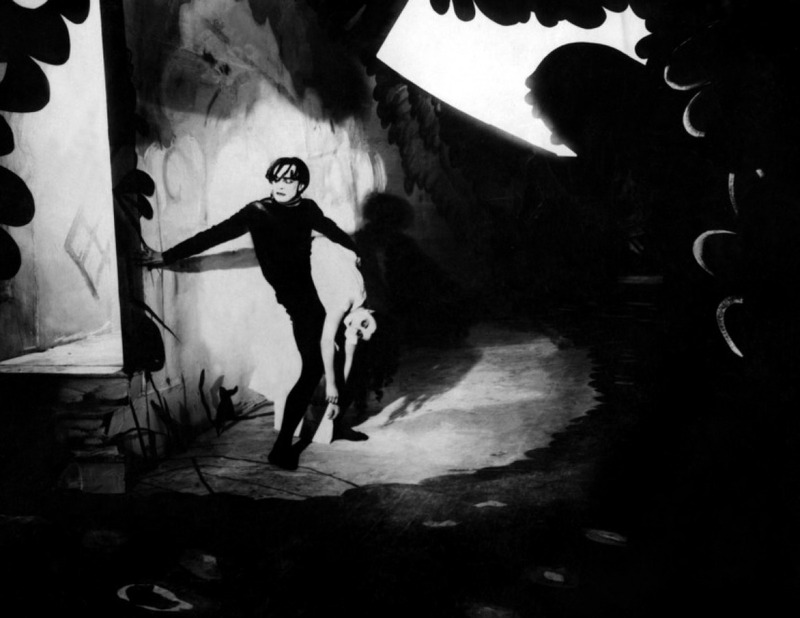 German Expressionism is the movement currently about to explode and take over European film and Caligari is no doubt part of this Avant Garde. Though breaking the taboo of “it was all a dream” scenarios seems to be the norm in these days of the post Inception (2010) thriller, in 1920 it was no doubt a surprise to find ambiguity in whether we were seeing the retelling of a horrific tale, the imaginary depiction of a madman or a true tale of control and murder. The end however dispels all doubt as to what is actually happening yet the majority of its 72 minute running time basks in the languid nature of this uncertainty. In terms of narrative, the film is relatively simple. 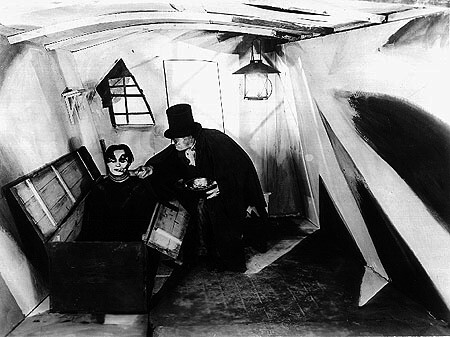 Dr. Caligari is a hypnotist who has control over somnambulist, Caesar, who he is using to commit murders. This isn’t a film to pick apart the narrative which is handily supplied through some of the most beautifully designed text slides in silent film. Instead the viewer should focus more on its truly impressive and unique visual qualities that are a rarity in film after the 1930s. The town where the story is set is a physical evocation of a typical slanted, European town, with many buildings and rooftops out of alignment with the normal viewing of angular visuals. This disproportioned nature is applied throughout the whole film where ceilings curve around, chairs are proportioned outside of the norm and view points are straight out of the later Van Gogh paintings. This is a film filled with shadows and each shot looks like a cubist masterpiece with detail and atmosphere carefully planned and prepared to a startlingly accurate degree. Weine is determined to create a whole world seen through his designed vision and there’s no doubt that his work has influenced gothic and horror traditions ever since. Tim Burton in particular seems to have taken this aspect to heart and almost all of his films borrow Weine’s design principles when approaching things likes buildings and doors. For a silent film, the performances are relatively nuanced rather than the usual over the top style associated with the era’s films. Werner Krauss may be the typical over the top villain but Conrad Veidt’s haunting portrayal as Caesar the somnambulist is one of the era’s greatest performances and would lay the groundwork for gaining much bigger roles for the actor including parts in the remake of Thief of Bagdad (1940) and Casablanca (1942). Weine would continue to explore the visual ideas of Caligari long into his career before the advent of sound changed cinema forever. Though the horror genre would be something he would return to every now and then (including the wonderful Hands of Orlac (1924)) Das Kabinett Des Doktor Caligari is his defining moment as a director and one that has left a permanent mark on both horror and cinema of all genres ever since. The Horror Score Rebellion Part 2 – Night Of The Living Dead And The Electronic Score.